The Ryan Gosling Blade Runner 2049 Coat is inspired from the second installment of the Blade Runner series, which is titled as Blade Runner 2049. 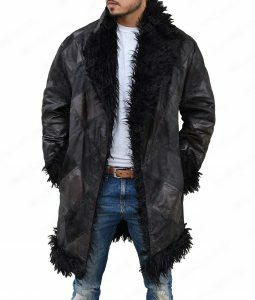 Ryan Gosling is the actor who was seen wearing it throughout the movie as Officer K. The Ryan Gosling Blade Runner 2049 Officer K Black Fur Shearling Coat is available in two appealing materials. The first material is black real leather, in which it features a faux shearling fur lining, open hem cuffs, with the signature stand up style collar that is fastened with a belted closure. The second material is in green and is made from cotton waxed, giving a very amazing representation of the original. It also has the same features but its texture and color are the only standouts. Best coat that I have ever purchased. I have watched the part one of the movie and it inspired me to purchase this Officer K coat before the movie gets out. I’m next watching the Rick Deckard Coat I have seen over here. I ordered this jacket in size large and it fits snug when I wear shirt inside. Exactly like I mentioned them. There is no issue in the length of the coat and sleeves. All lies at the point. The delivery and the service was quick. They were very active to reply my questions on time and also got the jacket within 6 days as mentioned. Truly an exceptional outfit to have. Thanks seller. Nice Coat. The color and the quality is good. It is a warm jacket. I had a small issue with the length of the sleeves, it was long a bit for me. If you’re tall then you must get this coat. I genuinely ordered it in large size because of my broad chest and 16” biceps. This coat is exceptional. The fitting is good just like the quality. It will be a better wear for winters. This coat is fine. The leather is very soft and finely made. This Blade Runner Coat is a perfect fit for me. I ordered the size medium. The length of the coat is average, not too long neither too short for me. The length of the sleeves is good and fur used inside of the jacket insulates very well. The shipping was delay but that’s ok. I can easy wear this coat when it’s below 0C out. I’m very pleased with my purchase. First of all, I really liked the services they provided me. This seller is very helpful and helped me out with my measurements. 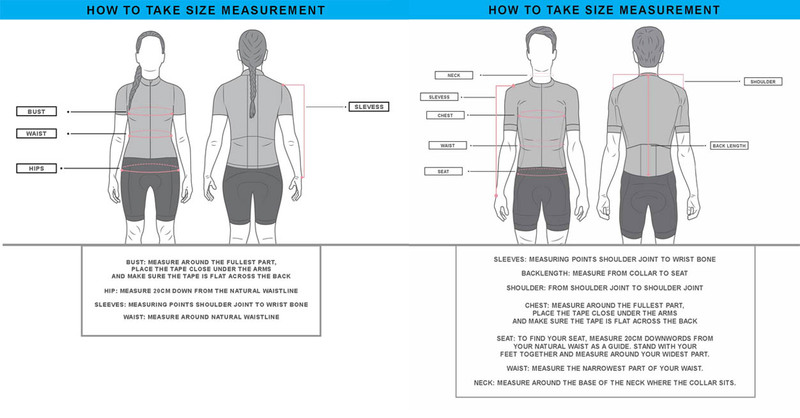 I even went to the tailor to get my accurate measurements because they mentioned they want to make it perfect for me. Lovely! The fitting, the length of the coat and the quality, all are just perfect for the price. The fur used is quite of good quality. The coat is not much heavy to wear and move around. It weights like usual leather jackets and it’s warm though. I will recommend this jacket to all the blade runner fans. This is a brilliant authentic coat for the price. The shine and the smell of leather is like the warmth of heaven for the people who knows the actual smell of hide. The thing I liked most about this Blade Runner 2049 Coat is that it has a magnet attached on the right upper part of collar that ease to hold it stand-up while the left part falls down. The fur is pretty new and gives the perfect warm feeling. I ordered size XL. For reference, I’m 6ft4in about 190lbs muscular body and chest 46″. The fitting of the jacket is as expected. I was first ordering it in XXL size but the customer service suggested me to order according to the size chart given and here it is. I now have a coat that worth every single penny i paid for it. Got an XL outfit. Fits perfect and everything is topnotch. Crafty details and striking black color is one of the factors that never keeps you away from the onlookers. NICE. This Ryan Gosling coat is exceptional and out of this world. The quality of the material is undoubtedly stunning and the stand up fur collar really makes you feel iconic among others. I was astonished with the unique front single belt closure as it shows the originality of the coat and it is the exact reason why i ordered this masterpiece from here. One of the best Blade Runners Coat I’ve found the internet. What makes this coat really special is its inner line cushioned notch collar that adds a solid swag on. I was really worried that I have ordered this sturdy outfit after reading the reviews and trusting my mind to go with this product and I was chilled out from the soul. Simply got the jacket as shown over here. I’m impressed with the quality this company is providing. Just received my coat from here and it’s amazing. The edge of the coat simply lies below the knee which is good. I ordered size large genuinely and it fits perfect though. Slightly allowing me room to wear shirt inside. The collar of the coat is as accurate as shown in the movie. It has a magnet on the right side of the collar that helps folding it. The lining is warm and cozy. 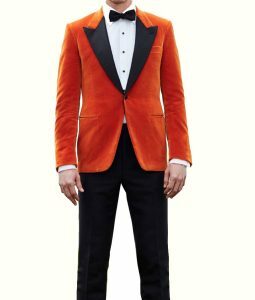 So far, I have seen so many versions of this jacket but I believe this is the accurate one available. This coat is simply perfect. I live in UK and this coat completely matches the styling sense here. The coat is pretty warm and will work best for me in winters. I ordered medium that is roomy a bit for me because of the US sizing I believe. Overall, it’s a nice outfit to have. Ordered it in PU leather. Excellent! As per other reviews, I ordered the large size for me and I was sure that it will definitely give me best fit. The coat is incredibly comfortable and does a great job of keeping me warm no matter if it’s windy, raining, or snowing. The material of the coat seems amazing that makes me feel comfortable all the time. The sleeves of the jacket were long, but it is ok for me and I satisfied with my purchase. I will purchase again from the site. I would definitely recommend it to others. Very good coat, It was a good feel and fit very well. I WAS NOT SATISFIED WITH HOW MY ORDER WAS DEALT WITH. I gave the product to exchange it and it took more than a month for them return it back. I agreed to ship it back to them since they requested it as it was a sizing issue. Today I received it and it was larger than what I wear. There was no use in sending it back so I gave it to my manager to wear it. He is happy, I ain’t! I have ordered the FAUX LEATHER/PU LEATHER version of the coat. This fit me quite nicely but not perfectly. The originally made reached below the knee I think (correct me if I’m wrong). The one I have and currently wearing is till the shin and is loose. I was expecting a straight fit coat but it became like an inch looser than a straight fit one. Never mind the fitting, I was happy that it was as described on the page. I have two of them now because my dad is gone out of town for a couple of days and he asked me to review his too. I have kept in mind the cons more than the pros of the coat. He got his in real leather and I went with the waxed cotton coat. I found that the real leather version had a better durable sense than cotton, naturally. As it was the first time I wore a leather coat, he said that its size is little lighter. Now, as both orders delivered on time and was the right size, the rating comes because of the detail difference as his is of real leather and he chose the one with the writing, the orders got mixed up. I got mine with writing, he didn’t. This was the only reason that I won’t be able to rate it 5 stars, considering the amount of time it took to process. This is worth purchasing. Great texture in the cotton waxed coat. “I recommend this product” and I fully stand by it but the replies for the pictures need to be better. It was hard to see clearly the new version of the coat as they have mentioned in the questions below. Answered by the admin	The color of the Waxed Cotton is blackish green very similar to the one seen in the movie. Answered by the admin	Your most welcome Sir. The model wearing the jacket in the image is wearing Cotton Waxed Version of the Blade Runner Coat. Feel free to ask any questions that you have. Thank You! Answered by the admin	Yes the jacket looks exactly the same as shown in the image. Feel free to order. 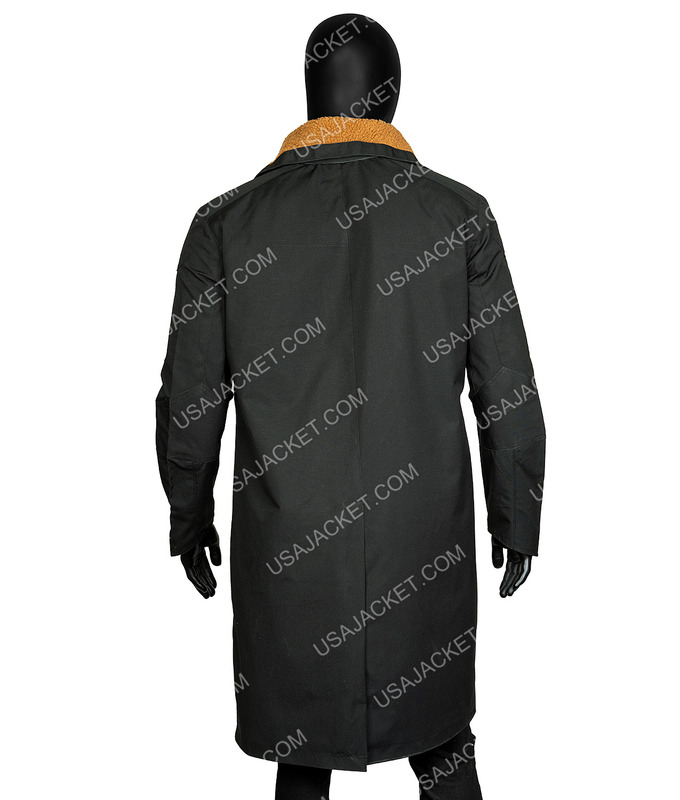 Answered by the admin	Hello George, the reviews that are mentioning that the jacket has magnet on the collar are for our previous version of Blade Runner Coat that has been changed in a while and we have redesigned it to look more like the original one. in short, there are no magnets on the collar. Thanks. Answered by the admin	The images of the finished product with detail images will be updated on the website very soon. We don't have the image of the current version available in stock right now! Answered by the admin	Hello, The images of the finished product will be updated very soon on the site. Yes, if you want the jacket with the printing on back, you just simply choose without print option in the variation section. The size of the collar and the length of the coat may vary from size to size. 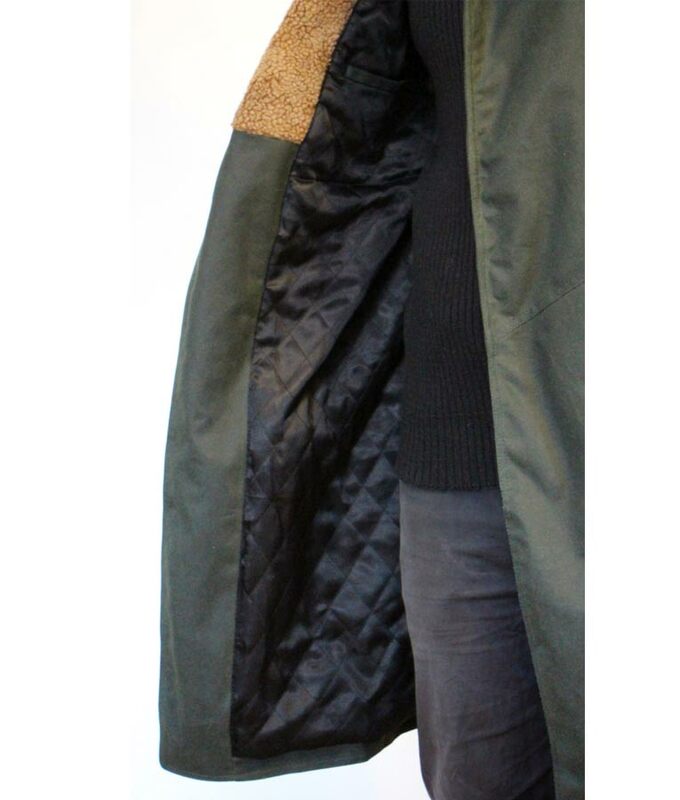 The standard length of the coat is knee height. Thanks. Answered by the admin	The images of the jacket as been sent you via Email. Answered by the admin	We have mentioned all the details of the jacket in the specification section. If you're talking about the cotton waxed version, it is prepared using the dark green cotton along with light brown fur lining as described in the picture. It also has the writing on the back. The collar is designed to fold like the actual one worn in the movie. We will be sending you the images of the coat very soon on the Email you provided and removing your email from the question from being it public. Answered by the admin	yes! Answered by the admin	Images forwarded to the email address you mentioned.